Tonight December 16th, 2009 sees the opening of Sickboy's ‘Logopop’, a special one-night-only solo exhibition of new limited edition work and site-specific installations in East London. Logopop, is a blink and you’ll miss it type exhibition that will run for a total of 3 hours only! Open from 6pm until 9pm, the show is is stictly invite only. But you can try and RSVP to: rsvp@thesickboy.com they may still have room on the list. 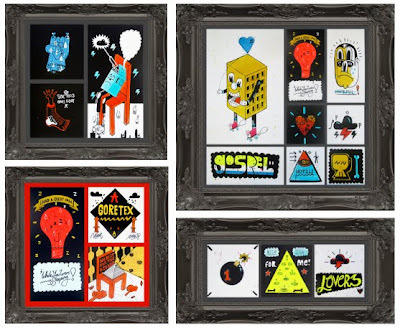 For those that are not in London or are unable to make tonight, Sickboy has opened an online Logopop shop featuring most of the work that will be on show tonight. Ye are gonna have to be quick, the limited Edition Logopop book produced to tie in with the show has sold out already! Go have a look here and check the super fresh work. We are really looking forward to seeing the work and installions in person at the Rag Factory tonight. See ye down there!